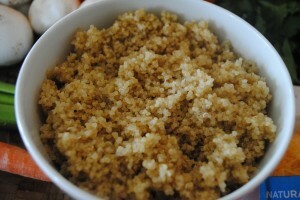 This recipe celebrates the earthy flavors of quinoa, one of my favorite ARTISANAL grains. 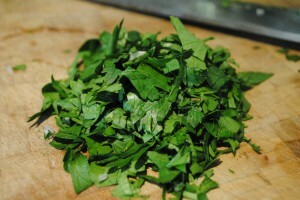 It’s not often that I find myself at a loss for what to cook, but when I do, I try to utilize what I have in my herb garden and pantry to create a STELLAR dish. Two days ago, I was having one of those moments and needed some inspiration. 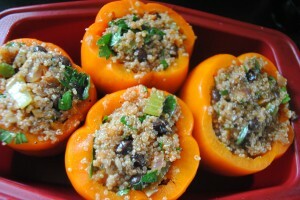 With a little research, a look through the shelves in my kitchen, a glance at the herbs in my garden and some imagination, I came up with a fantastic and tasty recipe for quinoa stuffed peppers that isn’t as OUTLANDISH and bizarre as it sounds! 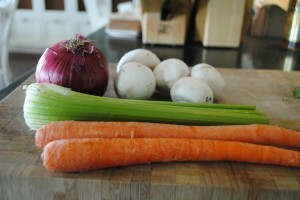 Dice the onion, mushrooms, celery stalks and carrots. 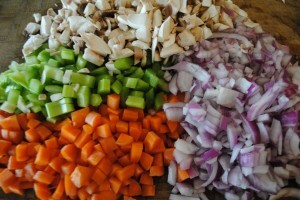 A classic mirepoix plus mushrooms. Cook the vegetables in a large pot on medium heat with a drizzle of olive oil. 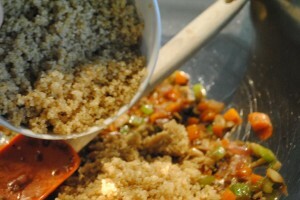 Stir occasionally for about 15-20 minutes or until soft. Add the mushrooms and cook for another 5 minutes. 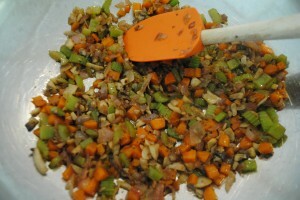 Place the cooked vegetables into a large bowl. 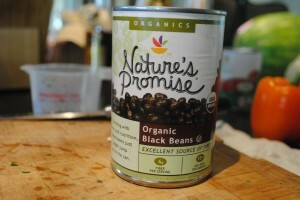 Next add in the black beans. 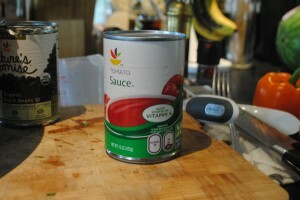 And the tomato sauce for moistness. 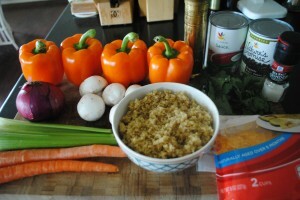 Stir together all of the ingredients. 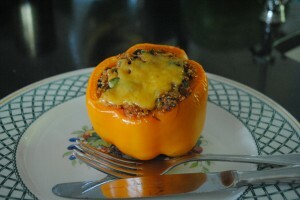 The mixture is good on its own but is even better inside the peppers. Season with salt and pepper to taste. Place the peppers into a baking dish and lightly drizzle with olive oil. 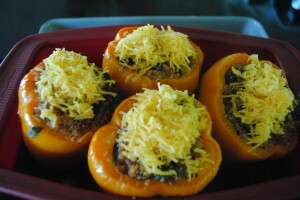 For this recipe I used orange peppers but green bell peppers are my favorite. Stuff the quinoa mixture into the peppers, wrap the top of the baking dish with aluminum foil and bake at 350ºF for about 40 minutes. Remove the foil and cook for another 15 minutes. 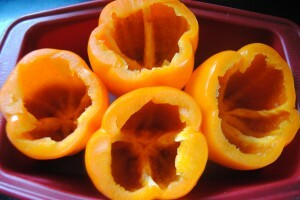 Sprinkle the cheddar cheese on the peppers and broil for about 3 minutes until the cheese is melted. Remove from the oven and dig in! Who said healthy and delicious can’t be used in the same sentence? 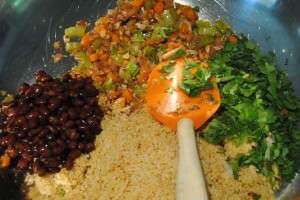 This entry was posted in First Course (Appetizers), First Course (Appetizers), Recipes, Side Dishes, Vocabulary. Bookmark the permalink.